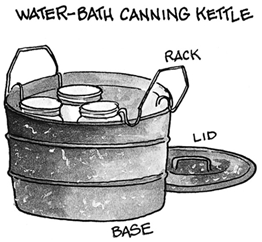 Canning is a preservation method that involves placing foods in jars or similar containers and heating them to a temperature that destroys micro-organisms that cause food to spoil. During this heating process air is driven out of the jar and as it cools a vacuum seal is formed. This vacuum seal prevents air from getting back into the product bringing with it contaminating micro-organisms. Cleaning usually involves passing the raw food through tanks of water or under high-pressure water sprays, after which vegetable or other product is cut, peeled, cored, sliced, graded, soaked, and pureed, and so on. Almost all vegetables and some fruits require blanching by immersion in hot water or steam; this process serves as an additional or final cleansing operation. The filling of cans is done automatically by machines; cans are filled with solid contents and, in many cases, with an accompanying liquid (often brine or syrup) in order to replace as much of the air in the can as possible. The filled cans are then passed through a hot-water or steam bath in an exhaust box; this heating expands the food and drives out the remaining air. Immediately after the cans are exhausted, they are closed and sealed. The sealed cans are then sterilized; i.e., they are heated at temperatures high enough and for a long enough time to destroy all microorganisms. The cans are then cooled in cold water or air, after which they are labeled. 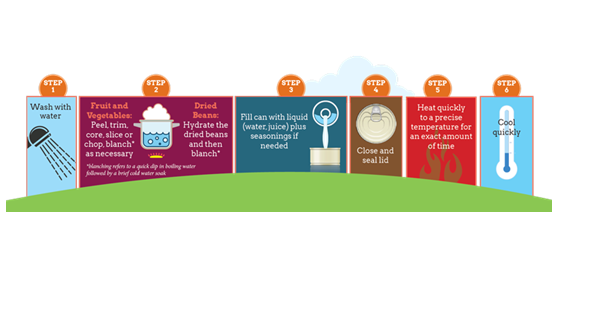 In the hot water canning method, jars of food submerged in boiling water (212°F at sea level) and cooked for a specified amount of time. 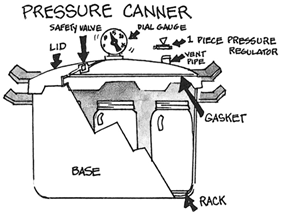 In pressure canning method,jars of food are placed in 2 to 3 inches of water in a special pressure cooker which is heated to a temperature of at least 240° F. This temperature can only be reached using the pressure method.